This tutorial will review the process of enabling SSL use on your vBulletin website. This will allow the users on your website to always access it using the secured https protocol. It will keep their sensitive information (such as credit card details) safe. To configure and force SSL use on your vBulletin website, you need to complete two steps first. The first thing you will need to do is to get a valid SSL certificate for your domain. This is a paid service that you can purchase via your Client Area. Then, you can set a forced SSL use via the .htaccess file of your vBulletin website. For that purpose, you will have to access your cPanel account and then navigate to the File Manager service. Select the Home Directory and Show Hidden Files options. When ready, click on the GO button to proceed. Navigate to the directory, where you have installed vBulletin. In our example, we have completed that installation within the public_html/ directory. 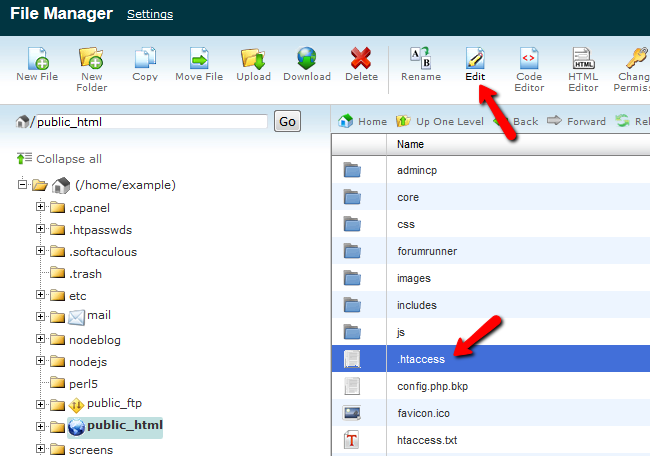 In there, locate and select the .htaccess file and then click on the Edit option at the top menu. Don't forget to substitute the domain.com with your actual domain name and then click on the Save Changes button.